Please join Richard Cordaro and Shelley Bednarski for the next PPAF Eat and Greet. 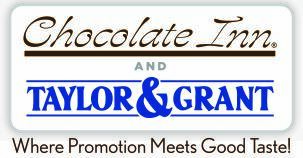 Shelley, represents Chocolate Inn and Taylor & Grant, and Richard represents Imagen Brands, Crown Products, and Vitronic. All distributors are welcome to attend and learn more about these lines. Chocolate Inn is the largest manufacturer of candies and confections in North America. We will discuss how to get the conversations going for the upcoming holiday season and look forward to repeat orders each yet. We will also discuss why incorporating food products into their promotional presentations for their day-to-day sales will set them apart from their competition. Imagen Brands offers customers an unparalleled selection of products and solutions. We follow the latest trends to inspire fresh and creative ways to enhance your image! Crown Products feature unique and exclusive products including the following brands: Coleman, Blender Bottle, and Silipint. Vitronic brands include: Coleman, Andrew Philips, Chelsea Teddy Bear, Gund, Isotoner, Magnetic Mark, mykit, and totes Isotoner and Umbrellas.